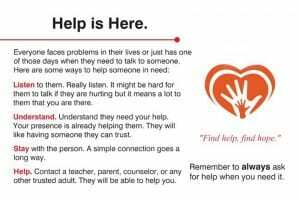 Four years ago, South Orangetown Middle School health education teacher Vickie Shaw and Library Media Specialist Kimberlee Landgraff developed the “Help Card,” a tool for students to decrease the stigma of asking for help. Customized Help Cards and informational videos are created for each of the district’s four schools to encourage students to ask for help. The 2018-19 district-wide campaign launches September 17, with video screenings and card distribution in every building. “We want students to know that asking for help is a strength not a weakness. Everyone needs help from time to time,” says Shaw. Parents, please view the Help Card video with your children and reinforce that it is OK to ask for help and that there is always someone who will listen. But students who do lose their Help Cards can pick up a new card in their school main office or, for middle and high school students, in the counseling office. Click here to view the Cottage Lane Elementary School video.